I wouldn’t know how good this tangzhong recipe is until I tasted the fluffy buns that made from it. My friend, SK told me she nearly makes fresh bread everyday for her family with the tangzhong recipe. She’s got so many good and creative ideas of making different fillings for her buns. I can tell she’s more addicted to making tangzhong bread than me, and admire her passions. She really motivates me in turn, and I feel myself have to pick up baking bread more often. The question is that what fillings I can wrap inside the fluffy buns. I recalled the first moment I tried the apple custard scrolls from Bakers Delight a few years ago, I immediately fell in love with their creamy custard mingled with fragrant diced apple inside. 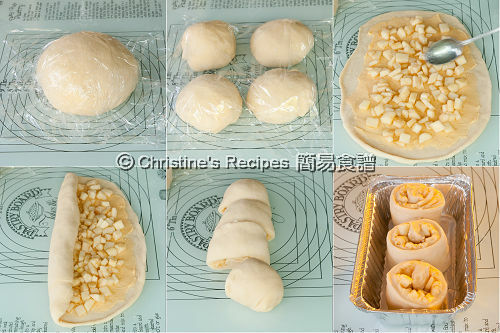 Here I experimented to whip up the filling for baking more tangzhong buns. Place egg yolks with half of the sugar (25 grams) in a bowl. Beat until it becomes thick and pale in colour. Sift in flour and combine well until smooth. Use a small saucepan to heat milk and butter over low heat. Add the remaining sugar (25 grams) and cook until completely dissolved. Let cool for a while until it’s lukewarm. Deflate and divide the dough into 4 equal portions. Knead into ball shapes. Cover with cling wrap, let rest for 15 minutes (as picture shown). Meanwhile, to prepare apple filling: cut the apples into small cubes. Mix with the sugar and cinnamon powder. Roll out each part with a rolling pin into a rectangular shape. Place custard filling evenly onto the surface of dough. Sprinkle diced apples on top. Roll from top to bottom to enclose the filling. Cut into four equal portions. Place them on a baking tray lined with baking paper. (Note: I placed three of them in an aluminum baking tray as picture shown.) Repeat this step for the remaining dough balls and fillings. Cover with cling wrap or a wet towel. Leave it for the 2nd round of proofing, about 45 to 60 minutes, until double in size. 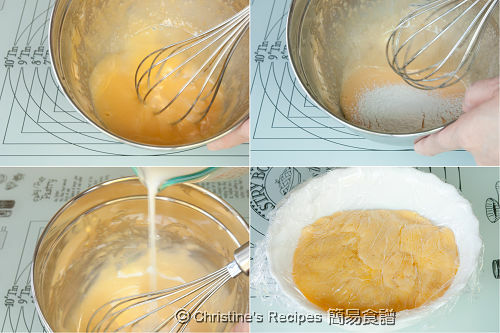 Brush whisked egg on surface of buns. Sprinkle almond on top. Bake in a pre-heated 180C (356F) oven for 25 to 30 minutes, or until golden brown. Remove from oven and let cool completely a wire rack. I found making dough with tangzhong method is best carried out by a breadmaker as the dough is pretty wet, so kneading by hands would take more effort and time. Many readers from US sent emails and asked me how to convert the measurement of grams to cups. Unfortunately, there’s no one formula to do this job. So I weighted every ingredient first, then measured one by one with metric cup/teaspoon afterwards. Hope it helps you all who are interested in making the tangzhong bread. Kindly note that if you can buy an electric kitchen weight, it’s worth saving you from any errors in doing the conversion. Best of all, there’s no limitation for you to try all recipes you like that found on the internet. Happy baking! It looks delicious! I wish I was your neighbour. Hi Christine - thanks for the tangshong recipe - I am hoping to make it one day as judging from your super looking custard buns, I can actually see why people go crazy for this dough. I love bread made from the tangzhong method- it's so light and fluffy!! These buns look delicious! The apple custard filling sounds really good- I'll have to try this one day! big fan of yours from the US. I have made the tangzhong bread according to the recipe and it is delicious! my husband was so impressed that he couldn't stop eating it!! I can't wait to try this recipe - custard are always yummy. Thanks!! 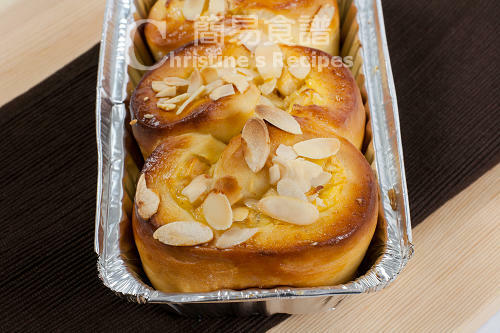 These custard buns look really super! Beware that if you add too much flour in the process of kneading, the texture of your bread would turn to be dry and can’t keep soft for days. Who loves fluffy buns? I do :) ..These apple custard buns is reminding me of Summmer's end and the beginning of Fall. Christine, the buns look so so good, I wanna ve some!!! This is new to me, but I love cakes/pastries with apples and custard, I am sure I would love these too! These look perfect. I can imagine the soft texture and flavour. Love the apple filling. Thanks for showing the step-by-step instructions. These buns look irresistible! I would love them with a cup of coffee in the morning! Oh my, I want the whole thing! I have to try this tangzhong method. I love that methods. I used for quite a few of my bread recipes. 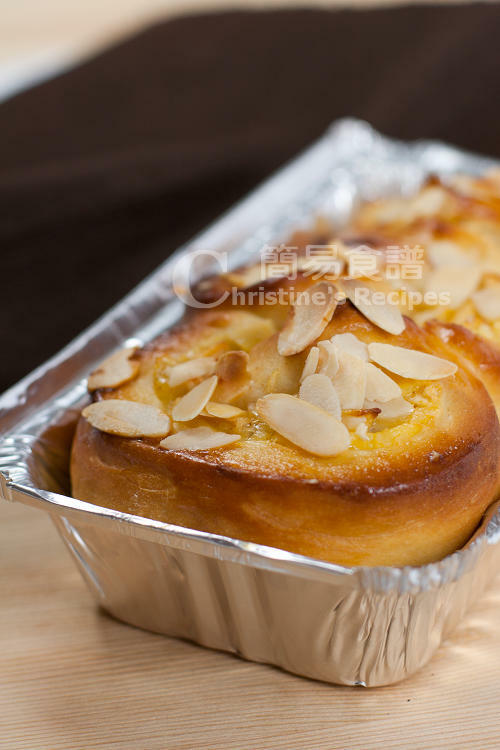 the bread is so fluffy and soft after 4th attempts,it is so good my husband and my friends are so impressed.Christine is right, I am addicted to making more tangzhonng bread.this is the best bread recipes I ever made! I have been making bread using this bread dough recipe for a couple of times already. I wanted to make this one last night, but I chickened out and deviated to something similar :) It turned out great, thanks for the recipe which allows me to come up with my own variations. 1) how much custard filling should we spread on the dough? 2) shouldn't we saute the diced apples in a little butter to soften them a bit? Hope you can answer my questions asap. Thanks a lot for this wonderful recipe! 1) Just spread the filling evenly on the dough. The amount is all up to you. If you want more, spread more. 2) I didn't cook or saute the apple beforehand because I like it with a bit of texture and not too mushy. But you can do so, if you like. Christine, I love ur blog and all ur bakery recipes..
Btw, I'm using bread machine to knead the dough but the dough was just too sticky that I can't roll into rectangular shape . Is this normal for tangzhong method? I used the "dough" setting to help knead the dough, and let it sit in the machine for the 1st round of proofing. Then turn the dough out for shaping. The tangzhong dough is quite wet and sticky. But after kneading and proofing, it's still workable. Just sprinkle a little of flour to prevent from sticking to your work surface and help to shape properly. 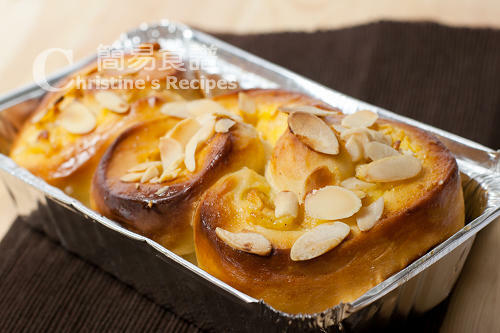 Hi Christine, i don't have a bread machine, and have failed to make the tanzhong bread by hand, but was wondering is it possible to make this recipe with an electric mixer with dough hooks? Thanks! Some of my fans used electric mixers with dough hooks and they made it. Guess that you can give it a go. Hi Christine, since the dough is so sticky can i spread some oil on hand before kneading? Will it affect the texture of bread? Thanks! A little bit of oil or flour on the surface won't hurt the texture. Yo. I made this dough. Came out supah hot fresh. I had tried several of your bakery recipes and have a question. I am not using a bread machine and like to know if you do your proofing in the bread machine or just room temperature? I understand that some of your recipes say to proof ideally at certain temperature/humidity. I live in brisbane (same as yourself) and wonder how long do you normally proof in brisbane's weather. Thanks for your advice. I often use my breadmaker to knead the dough. After finish kneading, I just leave it in the machine for the 1st round of proofing. For the 2nd round of proofing, I leave it in room temperature. It works all the time, because the weather here in Brisbane is not too cold. You just wait until the dough becomes double in size. If the weather gets a bit cooler, simply wait a bit longer. If you want to speed up the proofing time, you might put your dough inside your oven, with a cup of hot water next to it. The heat of the hot water will help speed up the proofing. Ah - thank you for the tip. I just baked the pai bao and jap cheesecake for tonight's home group... they are looking good! You're welcome. Enjoy the great time with your group mates ! Have been followed your post for a long time and had tried using tang zhong to bake bread but I don't understand why it does not turned out as good (soft) as yours and it becomes a bit hard the next day. I can't think of any other reason except the oven (not sure if there is anything to do with oven). Could you please advise when making the bread, should I use the fan forced mode or the conventional mode? (I live in Australia and therefore I have the oven which is attached together with the cook top). Also, I use the Brevile bread machine to help making the dough. Perhaps it is something to do with that too? I got a friend who also uses Breville bread machine. Her tangzhong bread always turns out soft and fluffy. She even doesn't test whether the dough passes the window pan test or not. Think that it's not because of the dough as long as you have the correct measurement of all ingredients. Guess that it could be the oven heat was too high. Just experiment with a slightly lower temperature to bake your bread next time, and see if it'd be better. I'm going to try out your tangzhong method tomorrow. I use a hand mixer(with a a dough hook ) how many minutes would you say do I need to knead the dough for? And on which setting? (Do I use low, medium or high on my hand mixer?) I know the dough is ready when you can stretch it but since it's my first time i'm a bit nervous. Don't know what to expect. Thanks. Every mixer performs differently. Always start from low speed, then increase to medium. Keep checking if your dough can pass the window-pane test. If so, the kneading is done properly.